What could be better than embarking on an epic journey with the love of your life? The Campervan wedding invitation from Tree of Hearts is a brilliant portrayal of one of the most iconic and uber cool classic vans around. We LOVE camper vans here, so it’ll come as no surprise that we have a bit of a soft spot for this invitation! It takes us back to our trips exploring to Cornish coastline, parking up at the end of a busy day and sitting in the back with the doors opening looking out over to the Atlantic whilst we cook our supper on the BBQ. There’s nothing quite like it! With that in mind, we think this 145mm x 145mm Campervan design does a cracking job of symbolising the amazing trips and adventures that await you and your soon-to-be spouse in your new married life! 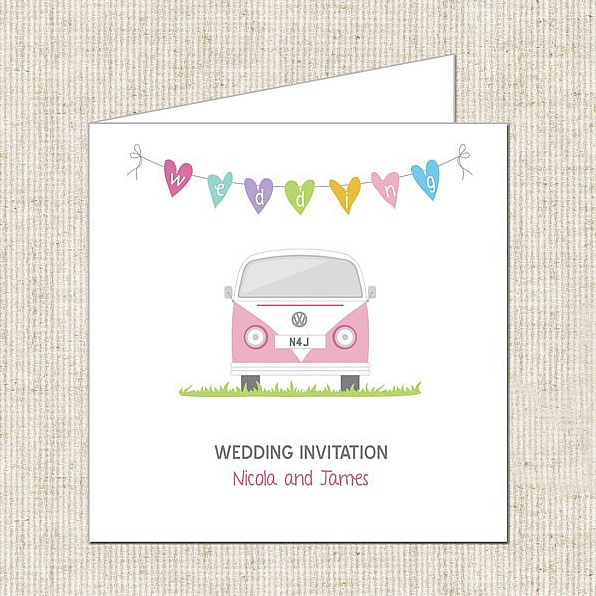 Printed onto Conqueror 300gsm ivory textured card, a lovely pink camper is seen parked upon a patch of luscious green grass, waiting patiently for the newly married couple to get in and drive away onto their next adventure. A line of multi-coloured heart-shaped bunting hangs sweetly above the van, with its little bows seemingly blowing gently in the summer breeze. Whether you’ve hired a campervan as your wedding transport, you’re hosting a summer wedding or your other half is a cool car fanatic, this invitation is perfect for those who are looking for a happy-go-lucky invitation with an emphasis on fun and simplicity.